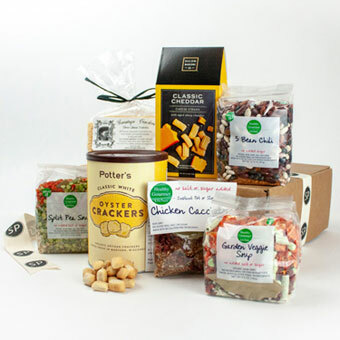 When the weather turns cooler, give a gift of comforting deliciousness! 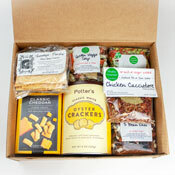 This abundant gift box is anchored by an assortment of healthy soup mixes and crock pot seasonings from Mary Song, upstate New York's answer to "what's for dinner"? Mary's Healthy Gourmet Kitchen soups feature gorgeous colors and layers of flavor you'll soon be enjoying. The ingredients are free of gluten, have no added MSG, salt, or sugar, and are Non-GMO and vegan. Easy to prepare, these are recipes that will work for practically everyone! We've included one each of 5 Bean Chili, Garden Veggie and Split Pea soup mixes, our best sellers in The Savory Pantry. You'll also find the ever-popular Chicken Cacciatore Crock Pot Seasoning. This northern Italian dish features chicken braised with vegetables in a wine & tomato sauce. Simply delicious and easy to prepare! To accompany the soups, we've chosen a generous tin of Potter's Classic White Oyster Crackers. They are great on soups and salads and in snack mixes and are equally yummy straight from the can! You'll also find a box of classic Cheddar Cheese Straws — a Southern delicacy for generations, crafted from aged cheddar cheese and pure butter with a hint of paprika and cayenne. A bag of Saratoga crackers completes this heart-warming gift. Healthy Gourmet Kitchen - 5 Bean Chili: A full-flavored chili made with heirloom gluten-free beans and premium spices. Healthy Gourmet Kitchen - Garden Veggie Soup Mix: Packed with vegetables. Just add water for dinner in less than 30 minutes! Healthy Gourmet Kitchen - Split Pea Soup Mix: One of our favorite soups, bursting with flavor and easy to prepare. Healthy Gourmet Kitchen - Chicken Cacciatore Crock Pot Seasoning: Everything you need to make this classic Northern Italian dish. Potter's Crackers - Classic White Oyster Crackers: Delicious bites of crispy, buttery, YUM and a great snack. Salem Baking Company - Aged Cheddar Cheese Straws: A Southern delicacy for generations, these crispy bites feature aged cheddar cheese and spices and are delicious with soups and salads. Saratoga Crackers - Three Cheese Travers or Classic White Crackers: The iconic Saratoga snack, perfect for soups, salads and spreads.